How do you differentiate yourself from your competitors? Unleash The Power Of Private Label Rights Riches! 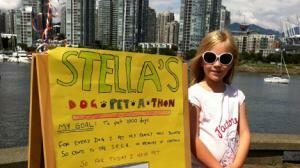 Stella McWilliam, 7, spent five hours July 21, 2012, hosting a 'pet-a-thon' and pledging money for the investigation into Captain the German Shepherd's death. VANCOUVER -- More than $50,000 has poured in to the SPCA to fund the investigation into the death of a German Shepherd found in a dumpster battered, bruised and barely alive. Among those who've rallied to find the person responsible for Captain's fatal injuries is a seven-year-old girl, who spent five hours on the weekend holding a pet-a-thon to raise cash. "I think he'd be very happy," Stella McWilliam told QMI Agency on Sunday. "I really like dogs and I'm sad when I hear something really bad that happens to a dog." Captain was found injured in a west-end dumpster last Wednesday and died the next day despite surgery. McWilliam set up a sign on Saturday along the downtown Vancouver seawall, initially pledging 50 cents for each dog she pet. She managed to pet 101 dogs, missing her target of 1,000, but her dad Crosby McWilliam put in $500 for her efforts. Friends and family also chipped in, bringing the total to about $1,400, McWilliam said. "Stella just coincidentally spent a week at SPCA camp to start summer," McWilliam explained. "It was a tough one, you don't want to show her the bad side of people but it's important to focus on the good that could come out of this kind of thing." Captain suffered facial cuts, bruises, neurological and spinal damage. Passersby discovered him in a dumpster behind his owner's house in the 1400-block of Maple Street. The owner has not been found. More than $50,000 was donated by late Saturday to a trust fund account set up by two employees at Vancity who were moved by the story. BC SPCA investigator Marcie Moriarty described the donations as beyond her "wildest dreams" and added there could be enough money to investigate cases beyond Captain's. "An animal did not cause this," Moriarty said Sunday. "I can't 100% rule out the possibility he was hit by a car ... (but) that looks very unlikely." Meanwhile, dog owners at a memorial walk Sunday dedicated to canines who've died described the German Shepherd's case as "heartbreaking" and "outrageous." "The injuries inflicted by whomever did this were just horrific and the fact the dog was dumped ... the whole scenario was just very disturbing to us," said Debbie Lundrigan, an Ocean Dog Rescue volunteer who lost her own dog, Maicie, last month. "We really need to increase the animal cruelty laws, they're just not enough. They don't make people accountable for their actions."